My friend Nicos and I sat down last night for our first skirmish game of Star Wars Imperial Assault since the release of Twin Shadows. I've often played with Nicos in the past (Darth Vader) using the most deadly force (Darth Vader) that the rules would allow me (Darth Vader). But this time, we were aiming for a more thematic and less competitive session. 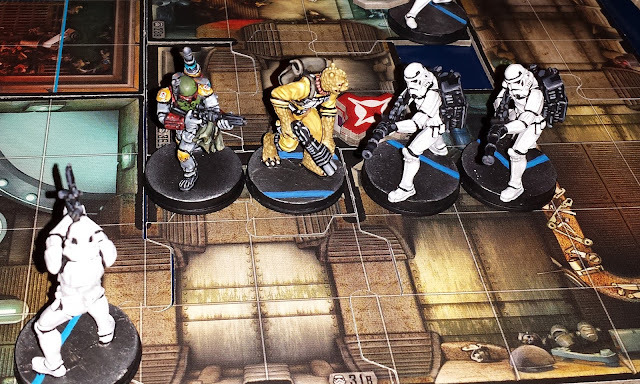 I opted to play the Mercenary Faction, with a special emphasis on classic Bounty Hunters, while Nicos tried out an Imperial force entirely composed of Stormtroopers. 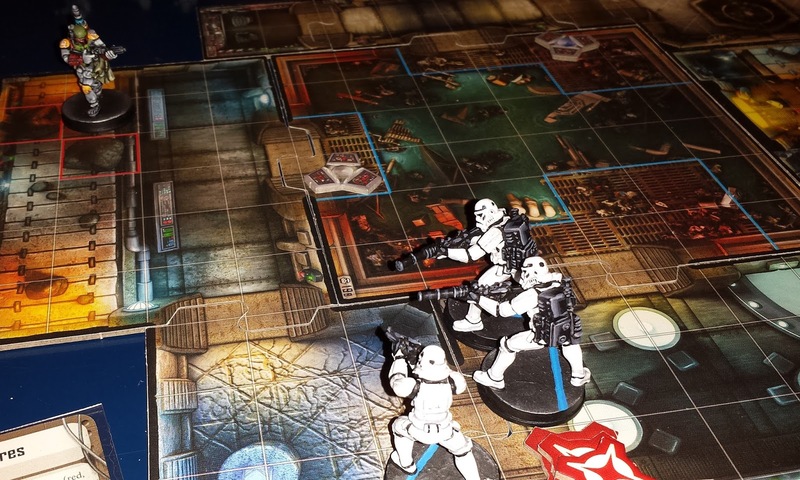 The result was the most exciting game of Imperial Assault that I've played. Command Cards: Overdrive, Mandalorian Tactics, Blaze of Glory, Emergency Aid, Dirty Tricks, Price on Their Heads, Capture the Weary, Focus, Element of Surprise, Take Initiative, Rally, Recovery, Celebration, Hard to Hit, Urgency. Strategy: Throw the Hired Guns into the fray in order to draw attention away from the more valuable figures. Focus Boba Fett's and IG-88's withering fire on key opponents and kill them from a distance. Pray that mobility compensates for the bounty hunters' lack of staying power. Nicos' Army: STORMTROOPERS! STORMTROOPERS! STORMTROOPERS! Strategy: Strength in numbers. The beauty of this build is that every single figure possesses the "trooper" trait, amplifying the power of such Command Cards as Covering Fire, Strength in Numbers, Rally the Troops and Rank and File. This fact also gives Kayn Somos wide scope for his special ability "Firing Squad". Deep in the Sewers of Nar Shaddaa, the lagoon of mystery contains a variety of "unknown treasures". These treasures (denoted by the "A" symbol on the map) can be used to heal a figure, give it focus or add movement points. Two of the eight treasures give the player retrieving them 4 victory points. This is an atypical set up. Most Imperial Assault scenarios require the players to seize and hold certain objectives in order to obtain decisive quantities of victory points. This leads to short and "objective oriented" games, where points are more important than carnage. But in this game, there are only 8 points worth of objectives on the table -- so victory can only really come from destroying the opposing army. 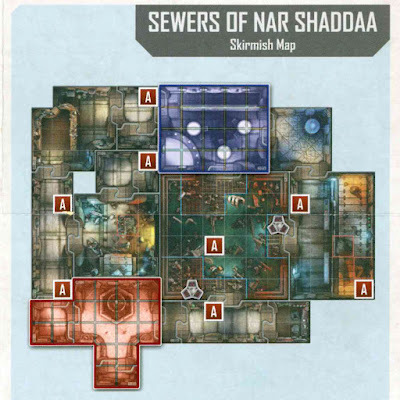 The map itself consists of a large central chamber flooded with water -- this chamber is surrounded on all sides with dank hallways and galleries. 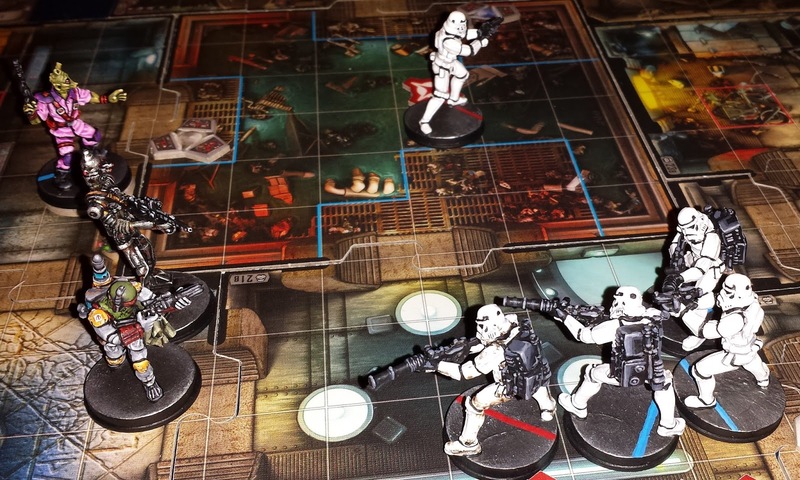 The Bounty Hunters won initiative and started in the blue zone, and the Stormtroopers deployed in the red zone in the south-west corner. From the outset, it was clear that the massed fire of the Stormtroopers would reduce the Bounty Hunters to charcoal if they tried to meet the Imperials head-on. So the Bounty Hunters adopted guerrilla tactics. In the first turn, as the Empire boldly advanced in lock-step formation, the Mercenaries fanned out along the galleries, sniping from the shadows and dodging back into cover. One unit of elite Heavy Stormtroopers ("Red Squad") charged up the gantry in the central chamber, with several regulars troopers and Kayn Somos behind them. One intrepid trooper even plunged into muck and shot a Hired Gun, but was himself killed by the Hired Gun's "parting shot". The Empire also sent a probing force up the western-most hallway ("Blue Squad"). Boba Fett nailed the lead Stormtrooper and then ducked to avoid the Heavy Stormtroopers lumbering after him. The turn ended with the Empire dominating the strategically vital main chamber and its all-important computer terminals. The Empire now had the initiative, and compounded their advantage by playing the Covering Fire card, which gave all troopers (i.e. each and every figure) the stun ability. 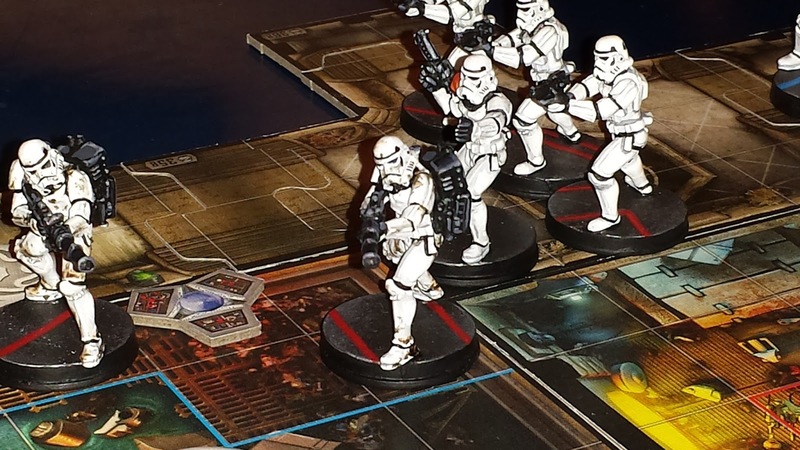 The Imperials also used the Reinforcement card to replace one of their fallen soldiers. Everywhere one looked, there was ghastly white armour. With their superior firepower, the Stormtroopers were able to vapourize two more Hired Guns near the main chamber. 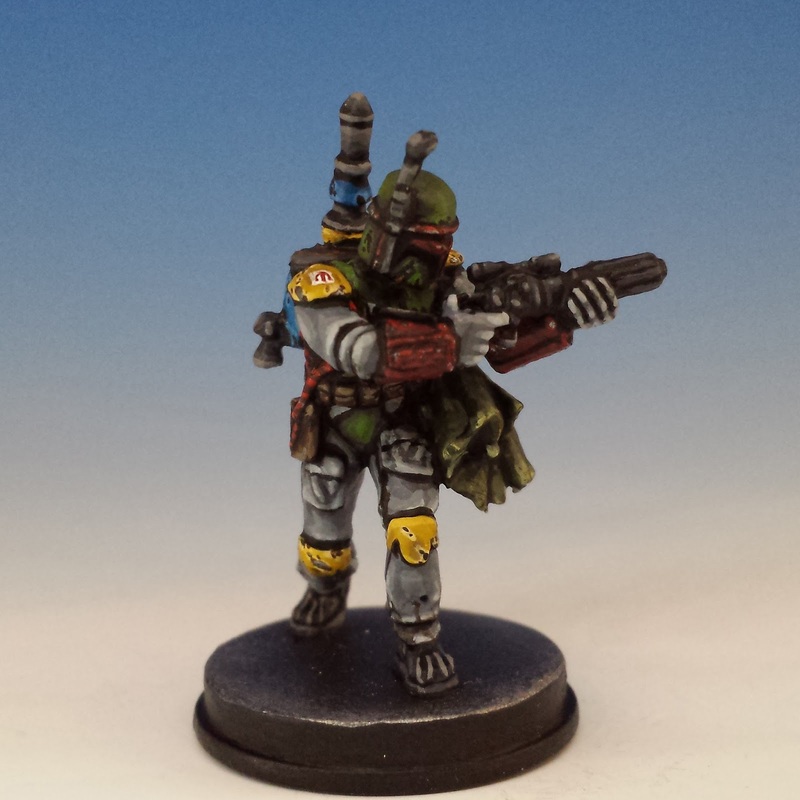 The more important Bounty Hunters did their best to retreat, waiting for the Covering Fire card to expire. The only exception was IG-88, who managed to injure one of the Red Heavy Stormtoopers wading northwards through the water. However, this wasn't really enough: with Kayn Somos behind them, the Heavy Troopers now occupied the very centre of the board, giving them a deadly vantage on the mercenaries. This was a very bloody turn. Things began on a sour note for the Bounty Hunters, as the Empire played the Seize Initiative card, pressing the Bounty Hunters before they could withdraw to safety. Two Blue Heavy Stormtroopers charged into close quarters, trying to gun down Boba Fett and a Trandoshan Hunter has they crouched in an angle of the north-west hallway. Luckily, the attack went awry, leaving Fett unharmed. IG-88 used the Overdrive Card to enter into a shooting frenzy. Seizing a window of opportunity, he fired a series of blasts at Kayn Somos in the centre of the main chamber, wounding but not killing the Stormtrooper Commander. Kayn charged north with the Red Squad and invoked his Firing Squad ability. The ensuing firestorm killed two Trandoshans and nearly fried IG-88. However, the death of the Trandoshans was a mixed blessing. With them out of the way, Boba Fett had a clear line of sight to Kayn Somos. Laying down the Mandalorian Tactics card, he smoked the Stormtrooper Commander with a headshot. Finally, the Bounty Hunters were doing what they do best -- taking down high-value targets. A Celebration command card punctuated this small victory. The game hung in the balance -- both sides were bloodied. Boba Fett started the turn by maiming another Heavy Stormtrooper and then moving to screen the battered IG-88, who was hiding behind a wall. 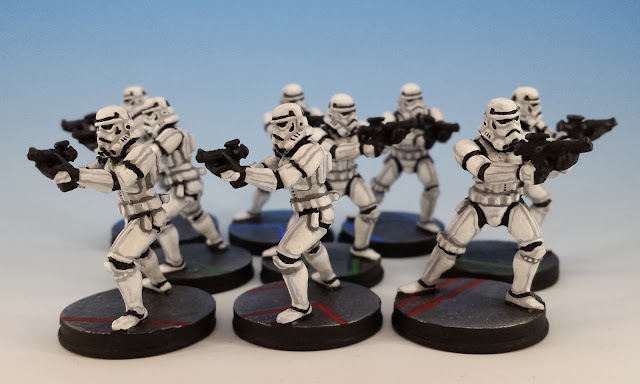 However, the remaining Heavy Stormtroopers formed into a solid block and advanced quicker than anyone had anticipated, thanks to a Rank & File card. This humble command card seemed to turn the fortunes of the game, because it allowed the troopers to see and shoot IG-88, who exploded under a salvo of blaster bolts. Playing their own Celebration Card, the Empire now had a strong lead in victory points, 35 to 28. When the dust settled, two regular Stormtroopers and 2 Elite Heavy Stormtroopers faced off against Boba Fett and a single Hired Gun. And even this Rodian thug didn't last long... at the end of a turn, he was shot in the face by a trooper -- but his parting shot managed to kill his killer, helping to even the odds for Fett. Now Boba Fett faced off against 2 Heavy Elite Stormtroopers and 1 regular trooper. At first, these odds seemed even (Boba Fett's 12 Health versus a combined total of 18 for the Empire). But Fett is a true killer. Using his superhuman mobility, Fett played a cat-and-mouse game with the Imperials, shooting and then rocketing away to some dark corner of the sewers. Although the Elite Heavies boasted deadly firepower, they could not catch up to the Mandalorian. It took a few turns, but with a grinding inevitability, Fett bewildered them, then wounded them, then killed them. Final tally... Bounty Hunters: 40 points, Empire: 35. A very close game. Although both forces were grand to play, they were remarkably unsuited to fighting each other. Bounty Hunters excel at killing heroes and leaders not cleaving solid masses of troops. On the other hand, the Elite Stormtroopers are best when using their own "blast" ability against concentrated forces, rather than trying to pick off isolated figures in a long-distance firefight. There was a lot to enjoy in the game. 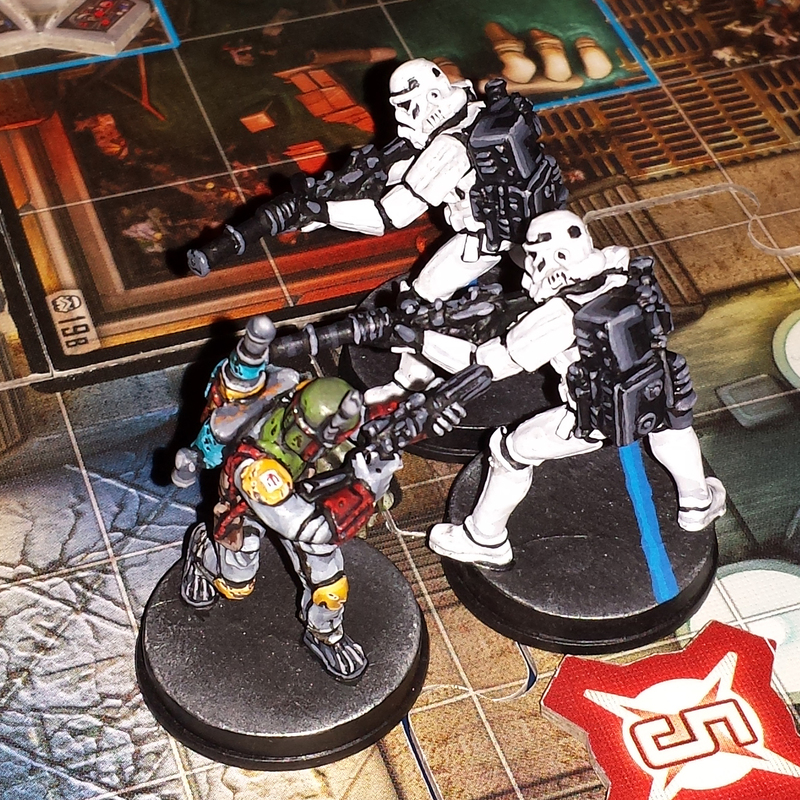 I was again impressed by how the cards and rules of Imperial Assault brought out the flavour of Star Wars. The bounty hunters are lone wolves; they're deadly but they don't really assist each other or complement each other's abilities. The Stormtroopers have menacing firepower, but are encumbered by their armour and restricted by their need to stay in formation. And in the end, of course, it was nice to see that Boba Fett really is a stone-cold badass. 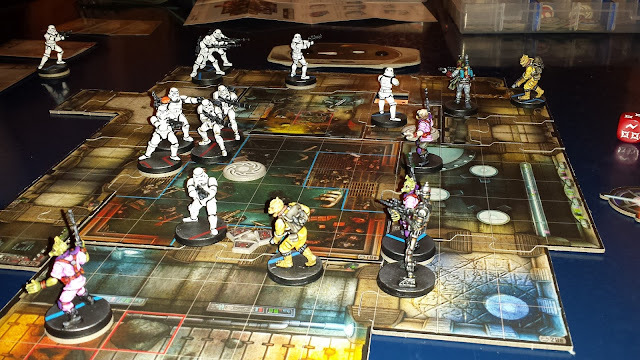 The best part of the evening, however, was the clash of strategies: the hit-and-run guerrilla warfare of Bounty Hunters Aplenty, versus the disciplined squad tactics of Stormtroopers! Stormtroopers! Stormtroopers! Who says that you need a bunch of rebels to make Star Wars fun. Firstly; great photography, we must strive to capture the spirit of our next game in a similar fashion. Secondly; your figures far outstrip any I've seen online or in person. This combined with some fantastic conversions have really raised the bar on the hobby aspect of the game; something which I don't think the game designers even considered. Thanks guys! I'm really glad you enjoyed the report. I always get a big kick out of writing these things. I eagerly await the sequels!